Ohhhh my goodness! What could be more adorable? Perfect for Easter or baby gifts. Size 7 (US) needles, DK or worsted weight yarn. Choose a color and knit up this adorable bunny for a little one’s Easter Basket. Knitted Anne Boleyn – oh my! This morning I finished reading a very interesting bio of Jane Boleyn, sister-in-law of the infamous Queen Anne. Then, as I was Stumbling rather randomly, up popped this astonishing site. There’s no reason to find this surprising, as, several years ago during a visit to Hampton Court Palace, I bought a cross stitch kit depicted Henry VIII and his 6 wives. I still haven’t completed the needlework, and my friend tells me I could do so more easily by leaving the heads off Anne Boleyn and Catherine Howard. That may just happen, but one thing’s certain; I’m not knitting this doll. This versatile pattern is a veritable menagerie in itself. 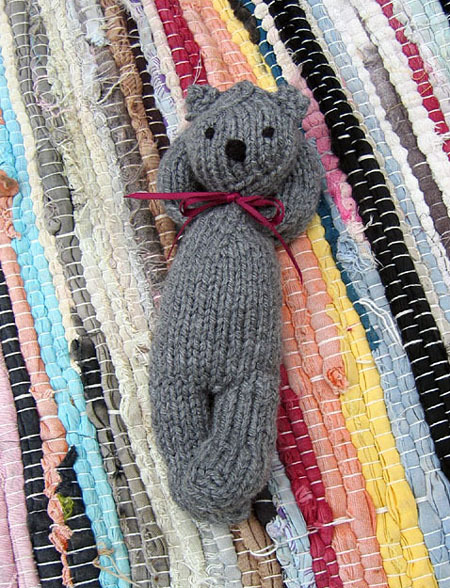 Cats and rabbits and bears…..
Can’t have a menagerie, even an imaginary yet-to-be-knitted one, without a bear. Harry’s invited, but no octopi, dragons, or snakes need apply. They’re nice, but not quite right for my animal shelter. Can’t stop! Here’s another pattern I’ve collected to support my new animal-knitting compulsion. Sit!